Benefit Cosmetic's They're Real! Mascara and Push Up Liner now comes in several new shades, and I just had to swatch them for you! In addition to the current line up of basic black, Benefit is launching the They're Real! Mascara in Blue and Brown, and the They're Real! Push Up Liner in Blue, Brown, Purple, and Green. Looks like Benefit's mascara and eyeliner have been popular enough to warrant adding new shades - I was told at the event I swatched these at that the They'e Real Mascara is a classic, and the They're Real Eyeliner is selling well too. This post isn't going to be too long, so without further ado, let's just get straight into the swatching fun! Overall, the colours of mascara and eyeliner released by Benefit were pretty much in the neutrals range, with the possible exception of the blue mascara. All of the colours are actually quite work-friendly, and wouldn't look out of place in an office, especially with the eyeliner shades. The shade range is also fairly typical - nothing too out-there or avant-garde, but they are great basics for everyday wear. They're Real! Mascara in Blue is a bright cobalt blue. I was expecting something more muted, like a navy, but this is actually fairly bright and going to be noticable if you apply it on your lashes. They're Real! Mascara in Brown is a light, cool-toned ash brown. This is probably a "natural" lash colour for some Caucasian girls with naturally brown lashes. They're Real! Push Up Liner in Blue is a deep navy blue. Unlike the bright blue of the mascara, this is actually dark, and a good alternative to black. They're Real! Push Up Liner in Green is a khaki hunter olive-ish kind of green. Very neutral and wearable, and would look good on almost all skintones. They're Real! Push Up Liner in Brown is also a cool-toned ash brown. Another wearable, neutral shade. They're Real! Push Up Liner in Purple is a deep eggplant purple. Again, this a good alternative to black, and would also look great on almost anyone. 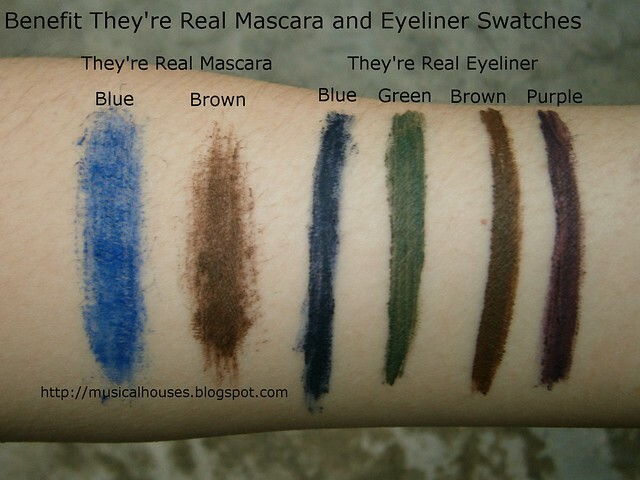 My first impressions from swatching is that quality and packaging of the the They're Real! Mascara and Push Up Liner new shades seems exactly the same as the old ones - so if you've tried and liked the They're Real! Mascara and/or Push Up Liner and liked it (or if you didn't), then chances are, your views aren't going to change by trying on one of the new colours. I've actually reviewed the Benefit Push Up Liner before, and found it to be good at drawing lines, although the formula was a tad drier than I would have liked (so the liner tended to crumble on me and so on). Overall, I'd say that if you liked the They're Real! Mascaras or Liners, and would love more neutral-but-not-boring shades to add to your collection, then these are right up your alley. The colours are quite universally flattering for the most part, and worth checking out if you like the formula. I really like the push-up liner and love that they've come out with additional colors! https://apps.facebook.com/panasonic_sg_vote/?eid=4&event=14&fb_ref=Default please vote for musical houses!